"What better way to hide than in one of your dresses? After all, hiding's a drag." After having made a huge ratings splash in Season One, Season Two of Mork and Mindy saw a few cast changes and a time-slot move that began an early series ratings slide that would plague the show for the rest of its run, even if it would continue another two seasons. Perhaps viewers were put off by creative changes and failed to follow the show to its new night. I suspect, though, that there was a more fundamental problem: a little Mork is silly fun, and Robin Williams' manic energy can be infectious. But too much, and the show starts to feel like an over-rich dessert: after a few bites, you start to feel a little queasy. Seeming to have come out of nowhere, there had never been anyone quite like Williams on TV since Jonathan Winters, and creator Garry Marshall made a smart choice in casting a charming if sometimes bland Pam Dawber for balance. 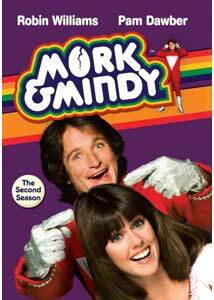 Mork needed little more than a likeable "straight man," and Mindy fit the bill. The plots are mostly high-concept nonsense with a singular purpose: give Mork an opportunity to jump on things. He's absolutely a force of nature, but best taken in small doses. There's a new twist to the opening credits: a background disco beat now makes it possible to dance to the Mork and Mindy theme, if you suspect that that's something you might enjoy (you might want to grab your rainbow suspenders for maximum effect). Season Two finds Mindy's dad gone (a regular in the first season), with his role filled by new regular Tom Poston, Mindy's curmudgeonly landlord (fear not, Mindy's-dad-fans, he'll be back by season's end). Having successfully spun-off from Happy Days, Mork is well established in Mindy's Boulder, Colorado attic space, but their impending romance has not yet reached its full flower. Jay Thomas runs the local deli hang-out, and Mindy is working on the campaign of a local ecological champion running for city council. Mostly, Mork jumps on stuff and Mindy looks first aghast, then chuckles knowingly. In between, Mork joins forces with the "Sillies" in a parallel universe, hangs with a Roddy McDowell-voiced robot, battles the evil Necrotons, gets a cheerleading job, and has a very special adventure with a sightless singer. Williams' is doing much the same style of seat-of-his-pants, mile-a-minute, improvised comedy that you either love or hate; loving Robin Williams will definitely benefit your appreciation of this series. There are some solid chuckles, many awkward titters, and a few instances where I was made uncomfortable in an "I'm a bit embarrassed to be watching this" kind of way. That "Sillies" episode, for instance, actually a double-length season premiere, goes over-the-top in a not-really-good way. Mork takes cold medicine that shrinks him down to microscopic size and sends him to a realm where he encounters several questionable celebrity impersonators, and cows wearing pants. It's wackiness on top of wackiness. As a concept, the show is at its best when Mork's outlandish alien behavior smacks up against American norms. In that same first episode, for instance, Mork decides that he can solve the energy crisis by smashing all of the street lights in the neighborhood, and Mindy can't really explain why that's a bad idea. That works, but when Mork's in a way-out situation with way-out characters, it's all just too much. A show like Third Rock from the Sun worked by playing things straight and letting the comedy come out of the aliens-in-the-burbs situation, rather than constantly trying to top itself with more and more elaborate high concepts. In Mork vs. the Necrotons, enemy aliens attempt a takeover of Earth. While Raquel Welch is great as the alien leader, the show loses something when Mork and Mindy are separated. The show rests on their sweet chemistry as much as on Williams' hijinks. Mork and Mindy absolutely has its charms, certainly if one can ignore the past quarter century during which Robin Williams has been doing more-or-less the same shtick. That's almost impossible to do though, and the freshness of Mork's over-the-top zaniness has thoroughly and completely worn off. Unfortunately, this isn't a show best suited to DVD. Some series work great in marathon doses, whereas this one is best enjoyed once a week or so with plenty of time off in the summer. Needless to say, though, every show is someone's classic. I could do with a little less silliness, but I would never try to talk a fan of the series out of catching up with an old favorite. Though the show is not particularly known for its pop music, the box does make clear that "some" music has been replaced. I didn't spot any scenes where music had been noticeably altered, but fans should take note. Image Transfer Review: There's some inconsistency here, particularly in the season premiere, which appears to have been mostly shot on film. The quality of that episode is off-putting, but the rest of the season has held up much better. Though there's been no significant clean-up, the episodes are largely clear with only minimal scratching and fading, and strong colors. Audio Transfer Review: The original mono track ain't fancy, but it's in good shape. Extras Review: Not a one. Pam Dawber must have been busy. Beneath all of the wild Robin Williams silliness, there's a genuinely sweet relationship between Williams and Pam Dawber that holds Mork and Mindy together. There's a lot of that silliness to wade through, though, and that's a bit hard to stomach sometimes. Like many of the CBS/Paramount series releases, this is a bare-bones set in terms of extras, but the picture and audio quality are perfectly adequate. Mork lovers should have no reservations about picking this up; others may wish to think hard about just how much Nanu Nanu is enough.